You are here: Home / First Real-Time Twitter Race? The 60-second race, billed as “the shortest race in NASCAR history,” ran during the live Wide Open coverage of the last 30 laps of the race. Fans were asked to Tweet their favorite driver’s car number, along with the hashtag #Sprint60. 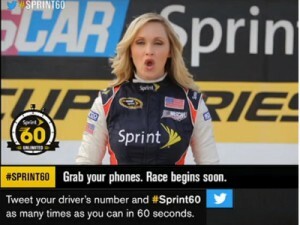 Each Tweet increased the driver’s speed, pushing them faster along the track as viewers watched the progress live. This was a direct call to action for watchers to not just participate in an example of Social TV gamification during an Ad spot, but also created a social share benefit in real time.